If you feel burdened by your dependence on glasses or contacts, refractive eye surgery can help reduce your need for corrective eyewear. Dr. Thomas Byrd offers photorefractive keratectomy (PRK) at his Detroit, MI, practice. This technique is often recommended to patients who wish to enhance their vision, but are not LASIK candidates. The procedures are similar, and can provide virtually the same results. For more information about PRK and other refractive surgery options, reach out to us today. PRK and LASIK are both means of reshaping the cornea to correct nearsightedness, farsightedness, or astigmatism. 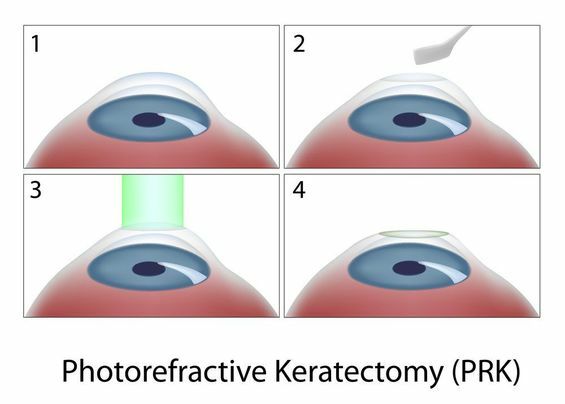 PRK (photorefractive keratectomy) is the predecessor to LASIK. The primary difference between the two procedures is how surgeons access the stroma, or center layer of the cornea. While LASIK involves creating a small flap in the epithelium, or outer corneal layer, PRK involves completely removing the epithelial layer. As a result, PRK involves a longer recovery. PRK is often recommended to patients who have thin corneas that cannot accommodat a corneal flap. While LASIK involves risks relating to the corneal flap, PRK eliminates these risks. Therefore, PRK can be the better choice for patients at a higher risk of eye injury in their day to day lives, such as athletes, law enforcement professionals, and military personnel. Patients should be aware that the PRK procedure requires a longer recovery time and comes with a higher risk of postoperative infection and inflammation. The surest way for a patient to minimize these risks is to choose a reputable ophthalmology practice. PRK is an outpatient procedure, usually lasting no longer than 30 minutes. Patients remain awake, but are relaxed with a mild oral sedative. Your surgeon will apply numbing eye drops to minimize any discomfort, and use a device called a lid speculum to keep the eyelids open during the procedure. Next, your surgeon will remove the epithelium and use an excimer laser precisely reshape the stromal layer. This device is computer-controlled and programmed to each patient’s exact prescription, ensuring that your results are precise and customized. PRK can be the better choice for patients at a higher risk of eye injury in their day-to-day lives, such as athletes, law enforcement professionals, and military personnel. Your doctor will direct you to look at a target light as the laser refines the cornea. Most patients feel no discomfort, though some feel light pressure on the eye. Finally, a soft contact lens is placed over the site to act as a bandage, protecting the eye while it heals. Once the surgery is finished, you will need someone to drive you home. Your doctor will prescribe topical antibiotics, as well as anti-inflammatory or pain medications to minimize discomfort and expedite the healing process. The epithelial layer of the cornea typically regenerates within five days. As you heal, you will attend follow-up appointments so that Dr. Byrd can monitor your progress. Most patients can resume driving within one to three weeks, though it can take three to six months to experience a full recovery. Dr. Thomas Byrd provides world-class service and personalized care. If you are interested in learning more about how PRK can help improve your vision, contact us today to set up a consultation.